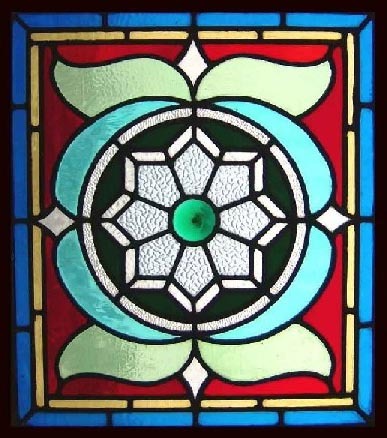 This Beautiful Antique Victorian stained glass window has outlived its original frame. It has been re-housed in a pine frame suitable for display purposes. The glass has no chips or scratches and the leading is good. Removed from a property near Laneshawbridge Lancashire. Circa 1899. The depth of colour in glass used in this widow has been obtained using methods which are no longer allowed Consequently glass as beautiful as this may never be made again. A RARE PIECE WITH A BEAUTIFUL RONDEL. This is a beatiful piece for any home. Frame 21 1/2"w x 19 1/2"h Glass 19" x 17" Shipping and packing for this window.USA $109 You can buy this now on credit card using the secure server paypal or woldpay link below the photograph or e-mail sales click here to arrange payment by personal check ,money order or bank transfer.